L to R: Hunter Sage, John Kiltz, Kenneth Aboussie, Matt Miller, William Peeples , Travis Eickenhorst, and Mike Burney at groundbreaking. 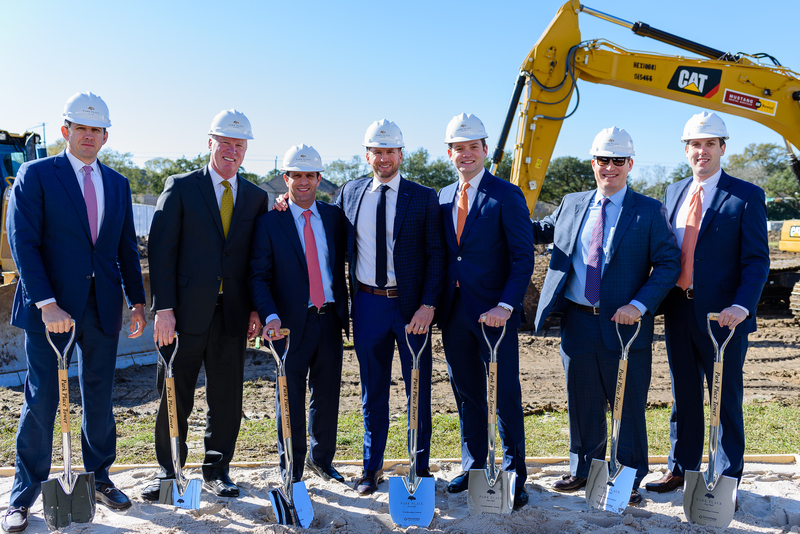 HOUSTON – (Realty News Report) – Stonelake Capital Partners held a ground breaking celebration Wednesday for Park Place Tower, a 15-story, 210,000-SF Class-AA office building located “inside the loop” at 4200 Westheimer Road within the Park Place | River Oaks development. Park Place | River Oaks is an 11.5-acre mixed-use development at the intersection of Westheimer Road and Mid Lane in the upscale River Oaks / Highland Village area of Houston. Stonelake assembled the land for Park Place in 2010 through five separate transactions. The site is about half a mile from Loop 610. “We have assembled a first-class team to design, finance, build, market, and execute Stonelake’s vision for Park Place | River Oaks which will create an unparalleled office experience in Houston,” said William Peeples, a principal with Stonelake who is leading the development effort for Park Place. Stonelake is a real estate private equity firm with offices in Houston, Dallas & Austin. Rendering of Park Place Tower. Park Place | River Oaks sits directly in between River Oaks District and Highland Village. Brad Beasley and Connor Saxe of Colvill Office Properties are responsible for leasing the office space at Park Place Tower while Bruce Wallace and Radkey Jolink of CBRE are responsible for the ground floor retail. Park Place Tower will be available for occupancy in Spring 2020. Stonelake is currently in lease negotiations with three tenants for space in the office tower. The building comes on the market as some submarkets have a considerably amount of vacancy. The year-end citywide office vacancy rate was 18.6 percent according to CBRE. However, the office market is undergoing a transition called “the flight to quality.” Tenants find new buildings more attractive and efficient and many are eager to move from older buildings to brand new office space with restaurants and amenities. 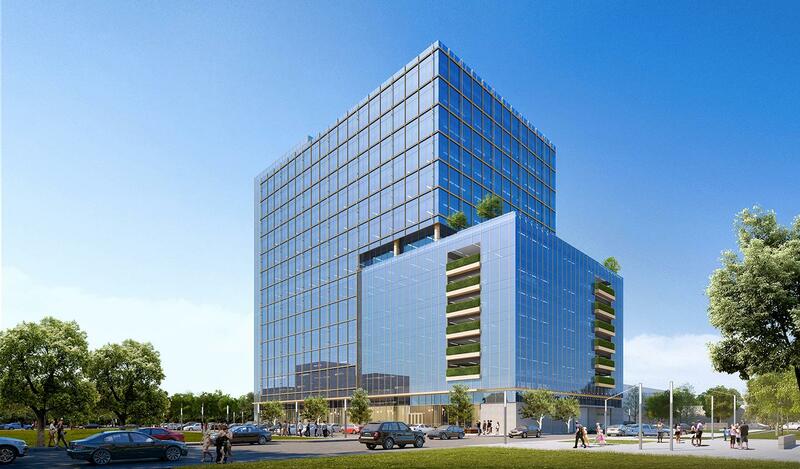 For example, Hines’ new high-amenity 1 million-SF Texas Tower under construction downtown is already 33 percent leased. Stonelake Capital Partners new building is located near the northeast corner of Mid Lane and Westheimer, about a mile due south of the Houston Arboretum and Memorial Park. Park Place Tower, which has efficient 27,249-sf floor plates, was designed by Beck Architecture and is being constructed by Harvey Builders as the General Contractor. Texas Capital Bank provided the construction financing for the building. Stonelake has developed three phases at Park Place | River Oaks. Phase 1 of Park Place | River Oaks, The James, is an 8-story, Class-A mid-rise multifamily building comprised of 344-units completed in July 2016. Phase 2 of Park Place | River Oaks, The Ivy, is a 17-story, residential building with 297-units which opened in 2017. Park Place Tower represents Stonelake’s third phase at Park Place and will include the 15-story office building with ground floor retail. Park Place Tower includes a beautifully landscaped terrace on the ninth floor available to all tenants and is surrounded by a 1-acre park in the center of Park Place | River Oaks.